News just in from Monica Paolazzi at Wally Yachts in Monaco that the new build 40m Wally 130 is for sale. 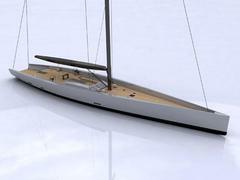 A breakthrough sloop developed by Wally with lines by Javier Soto Acebal, she's expected to be the fastest sailing yacht upwind. The deck layout is a continuous uncluttered area, with no designated social areas but intended for use in any way that the whims of owners and guests take them. The interior features, from bow to stern, the crew quarters with three double cabins, one guest double, one guest single, the owner's stateroom, another guest double and then the main saloon. The interior has Wally's trademark strong architectural accents and the Wally 130 is currently being marketed at €17 million.